SANTA MONICA, CA (January 8, 2018) – The incredibly moving and heartfelt family film, Wonder, heads to Digital January 30 and 4K Ultra HD Combo Pack (plus Blu-ray and Digital), Blu-ray Combo Pack (plus DVD and Digital), DVD, and On Demand February 13 from Lionsgate. Based on the #1 New York Times bestseller, and USA Today’s top-selling book of 2017, by R.J. Palacio, writer-director Stephen Chbosky (Beauty and the Beast, The Perks of Being a Wallflower) brings to life the uplifting story of a boy who inspires and teaches others that true beauty is found within. Certified Fresh™ on Rotten Tomatoes and co-written for the screen by Steven Conrad and Jack Thorne, Wonderstars Academy Award® winner Julia Roberts (2000, Best Actress, Erin Brockovich), Academy Award® nominee Owen Wilson (2001, Best Writing, The Royal Tenenbaums), Golden Globe® nominee Mandy Patinkin (1984, Best Actor – Motion Picture – Musical/Comedy, Yentl; 1995, Best Television Actor – Drama Series, “Chicago Hope”; 2003, Best Supporting Actor – Limited Series or Television Motion Picture, “Homeland”), and Jacob Tremblay (Room, The Smurfs 2). 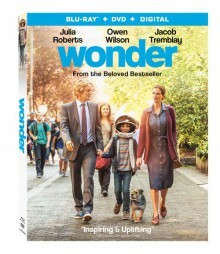 To enter for a chance to win a DVD copy of WONDER, send an email to contest@LatinoScoop.com. When entering, please submit your full name, email address and phone number. LatinoScoop will select a few winners. Winners will be notified via email.